Yes, that’s right: Waffle Toast. When I saw the name, I really thought it was a type-o. Then I mentioned it to Taste Tester and he said that it was something his mom made for him growing up. To quote the wordsmith Chris Griffin, “Whaaaaaaa?” I felt so out of the loop! I’d lived an ignorant life of breakfasts with my Cheerios and Pop Tarts. Bah! But finally, I have been enlightened and am here to tell the tale of this hybrid breakfast treat. With Betty Crocker’s recipe, you essentially prepare a biscuit batter (using Bisquick mix) with peanut butter mixed in, dunk in some white bread and toss it on the waffle iron. It’s crunchy and dense, but otherwise this recipe in particular doesn’t taste wildly different from your typical waffle. Given the thick batter, we couldn’t really detect the bread in there because the whole thing ended up being pretty dense. However, I suspect that was partly due to the waffle iron we were using. It makes waffles that are 1/2-3/4 inch thick. I think that if you were to use a belgian waffle maker (approx 1-inch thick waffles) the batter would spread more and you could taste both the batter and bread components, which I think is kind of the whole point. On the whole, this recipe is good, but not mind-boggling. Some pros are that it comes together really quickly, and the density lends a really pleasant crunch. It’s a nice way to get your CPB fix without eating something that’s too sweet, if you’re the type that can’t handle dessert for breakfast (amateur!). Topping the waffle toast with butter and chocolate chips added nice flavor and helped bring out the peanut butter, though I might suggest adding extra pb to the batter because, well… who doesn’t love a little extra peanut butter? Taste Tester’s mom later told me that when she makes Waffle Toast, she simply prepares french toast as usual, and then tosses it on the waffle iron instead of on the stovetop. So if you wanted to CPBify it, I’d suggest trying a peanut butter french toast recipe such as this one (minus the cornflake coating), cook it in the iron and finally, top with some butter and mini-chocolate chips. 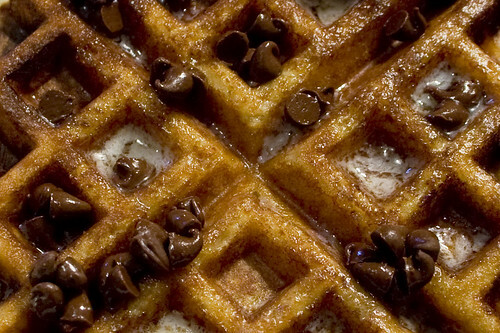 Find the path to breakfast enlightenment by trying Peanut Butter Waffle Toast. You can try the french toast method, as mentioned above or give this regular Waffle French Toast recipe a whirl. Just don’t forget to slather it in chocolate and peanut butter! Not sure my hips would like me to go for it, but my brains thinks it’s a very good idea right now!! I really liked the new idea. I added a little jelly on mine and ate it for dinner. Great! Mmm…my mouth is watering at the second image. It’s a pity we don’t have much choice when it comes to either peanut butter or chocolate, here in India. yummy, tastes the BEST with a little butter and caviar, but dosen’t EVERYTHING? I want to stick my face in that.